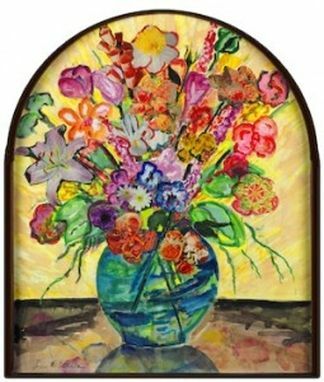 A window frame salvaged from an abandoned convent in northern New Hampshire surrounds this picture by Gloucester artist Lucette White. The flower's jewel-like hues capture the brilliance of sunlight filtered through stained glass. 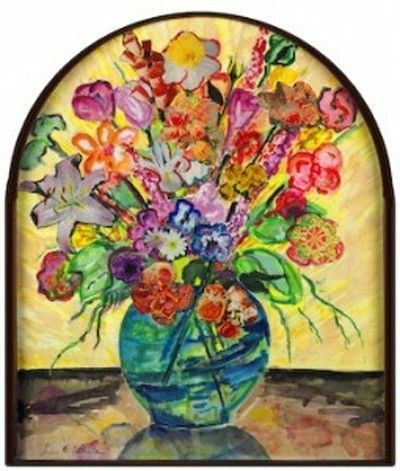 Composed of watercolor, ink and paper collage, "Blue Vase" is one of a series of sixteen works which incorporate the convent's window frames. This artwork was recently on exhibit at the Mercury Gallery in Boston.